There are hundreds of beautiful islands within Malaysia, most of them can be visited during your travels but not all offer a place to stay overnight. The islands of Malaysia are divided in the islands at the western peninsula, the eastern peninsula and the islands around Borneo. All are equally stunning, though there enough differences between each island. Most popular islands are Langkawi, Penang, Perhentian, Redang and Tioman. Around Borneo you have Lankayan, Selingan, Mataking and of course Sipadan. Mount Kinabalu is the tallest mountain in Malaysia and the 20th tallest in the World. Mainly because of the biological diversity the mountain is listed as UNESCO World Heritage Site. Climbing the mountain is not an easy feat for the untrained; though it will absolutely be one of the best experiences ever. Watching the sun rise in the early morning will definitely make you forget all the hardships you had to endure during the hike up. TAR Marine Park is the perfect place to enjoy scuba diving, snorkeling and light jungle treks. The marine park is made up of five small islands: Gaya, Manukan, Sapi, Sulug and Mamutik. The best beaches and probably also the best corals can be found around Gaya island; the biggest of the five islands. The marine park is only a 20 minute boat trip away from the city of Kota Kinabalu. Mulu National Park is the biggest national park in Sarawak. The park is best known for the amazing caves. The Sarawak Chamber is the world's biggest cave chamber. It is said that 40 Boeing 747 aircraft's fit in the cave. Clearwater Cave is one of the top ten longest caves in the world with a length of over 189km. The caves aren't the only highlights at Mulu NP. The amazing pinnacles at Mount Api are absolutely stunning to witness. A visit to Mulu NP will bring your holiday in Malaysia to new heights! One of the most popular destinations in Sabah is the Kinabatangan River. This river has a length of 560 kilometers and stretches through half of Eastern Sabah. Alongside the riverbanks there is an abundance of wildlife. During a river cruise you will have a chance to spot the rare orangutan, the pygmy elephant, proboscis monkeys and saltwater crocodiles. During night cruises you might spot the leopard cat, numerous sleeping birds, wild boards, snakes and many crocodiles. 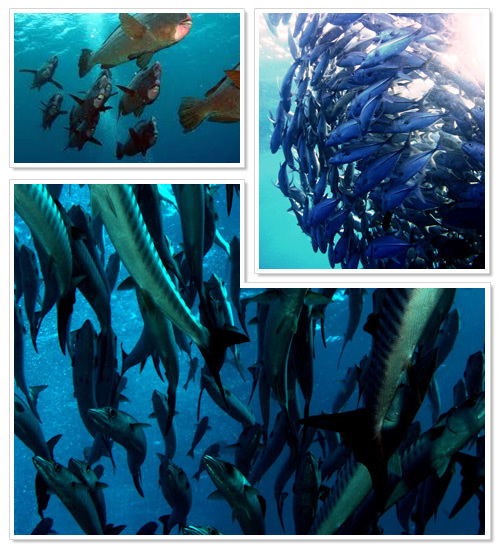 Sipadan is one of the most beautiful scuba diving spots in the world. Sipadan is the only oceanic island in Malaysia, the huge pillar that forms the atoll functions as a shelter for many sea animals and fish. Furthermore there are only a few places in the world that have such a concentration of sea turtles. Sipadan is not easy to visit; you can only stay at the surrounding islands Mabul and Kapalai. The permits these days make it even harder to dive at Sipadan; because only a handful of people per day may dive at the small island (regulations permit 120 dives per day). So it is important to get your Sipadan diving permit in advance. To get your permit, you have to book a diving or non-diving package to Sipadan Island (the longer your stay, the bigger your chance of obtaining a permit). Do know that accommodation at Mabul or Kapalai is not that cheap. Budget travelers that find Mabul or Kapalai too expensive (or when the facilities are fully booked) could opt to stay at the village of Semporna. This fishing village mainly serves as a gateway to Sipadan and other great scuba diving spots as Mabul, Kapalai and Mataking. The several fish restaurants in Semporna offer great food, though the village itself is often described as a bit dull. "I have seen other places like Sipadan 45 years ago. Now we have found again an untouched piece of art". Jacques-Yves Cousteau, Borneo: The Ghost of the Sea Turtle (1989). The permits were introduced in 2005 by Sabah National Parks to minimize tourism 'footprint' on the pristine scuba dive destination. It was the second step to ensure travelers could enjoy this fabulous scuba diving spot for many years to come. The first step was closing the resorts on the small island. Sipadan used to have some small resorts but to protect the environment these were closed. Nowadays tourists cannot just travel to Sipadan and get a permit on the spot; you have to reserve your stay beforehand and even then there is no guarantee you will eventually be able to dive at Sipadan. Permits are not for sale up front, they are distributed among the surrounding resorts (dive schools) and they are given out some days or the day before your dive. We have met people that did not make any reservations and ended up by not diving at Sipadan. There are also stories of travelers that just went there and did manage to get a permit. Diving at Sipadan normally is the goal of the whole trip to the area, but diving at surrounding dive spots around Mabul Island, Kapalai Island or even Mataking Island is (almost) just as great (especially if you fancy muck diving; smaller marine life like nudibranches). It is almost impossible to list all the fish and other sea creatures that you might encounter under water when diving at Sipadan. Among the species are schools of big-eye trevallies, many turtles, tornado-like formations of barracudas, schools of humphead parrotfishes, giant mantas, eagle rays, schools of tunas, many species of sharks including schools hammerhead sharks, (sometimes even) whale sharks and thousands of other species of fish (mostly big pelagic fish as Sipadan is known for this). Diving rates are pretty high compared to other dive destinations within Malaysia (usually over RM120 per dive). Do not dive with diving schools that operate without proper permits. Diving at Sipadan Island is possible daily from 6am to 4pm. No night dives are allowed. Read more about Scuba Diving in Sipadan at Dive the World. Diving at Sipadan Island can be done throughout the year as there is no real low season. During the months of January to March weather can sometimes be a bit unsettled so divers can expect more currents during their dives. Between April and June you can enjoy visibility up to 50m. Between May and August turtles often lay their eggs on the beaches of Sipadan. Sipadan once was center of a territorial dispute between Malaysia and Indonesia. In 2002 the International Court of Justice declared the island to be part of Malaysia. In 2000 members of the Filipino Islamist terrorist group Abu Sayyaf kidnapped 21 tourists at gun point. Armed terrorists arrived by boat and brought the victims to the nearby island of Jolo. All victims were eventually released after payment of a ransom. Some countries still mark the area around Sipadan as rather unsafe, though tourists have come here for years without any problems. As there is no accommodation on Sipadan Island itself, so you need to find a place to stay at some of the neighboring islands. Staying at these exclusive resorts will often cost many hundreds of dollars (USD) per person per night, though to many the price is absolutely worth it as this also brings you nearer to the best dive spots. Budget travelers usually chose to stay at Semporna; where more affordable accommodation can be found. For example Borneo Global Sipadan Backpackers offers a dorm room for RM22 per night, and a standard room for RM90 per night. There is also affordable accommodation on Mabul Island (nearby Sipadan); you can stay at My Scuba Diver's Mabul Homestay for RM120 per night (standard room with aircon, no additional charges for solo travelers.). As most guesthouses offer only a couple of rooms, make sure you make reservations up front! Below you can see the exact location of Sipadan (and Mabul & Kapalai) on the interactive map. The best way to travel from Kuala Lumpur to Sipadan is by direct (daily) flight to Tawau, from there it is a one hour drive by taxi or minivan to the small town of Semporna; where you can find the jetty to the islands nearby Sipadan. The boat ride takes about 1 hour (with the fast boat). If you made reservations at one of the luxurious resorts around Sipadan, then transport from Tawau is usually included in the package. There are also direct flights from Kota Kinabalu to Tawau; which may in some cases be a better route to take (as the arrival time at Tawau is better for the transport to Semporna if you are on an organized tour). Subscribe now to never miss a post! Subscribe to our email updates or the RSS feed, right now! Learn all there is to know about Malaysia with our Wonderful Malaysia Top 100 Tips eBook! Get your FREE copy of our eBook below.